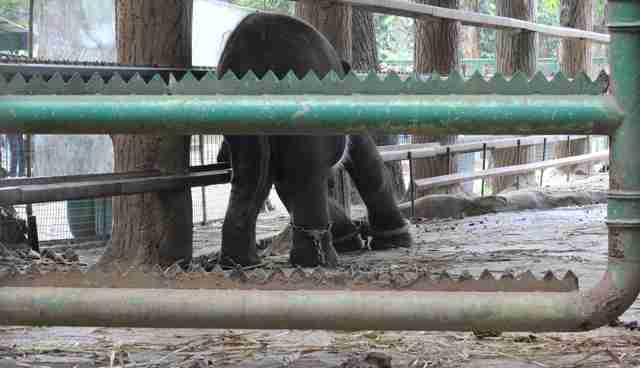 Captive elephants in Indonesia's Surabaya Zoo and Ragunan Zoo are being held in extremely cruel conditions, show photos recently obtained by The Dodo. "I have never seen ... this before," says a staff member of an animal advocacy organization. The source sent the photos to The Dodo, but requested anonymity because of the sensitive nature of animal welfare work in Indonesia. The photographs of the elephants were taken on a recent visit. At both zoos, says the staff member, the elephants were restrained in a severe and agonizing manner. 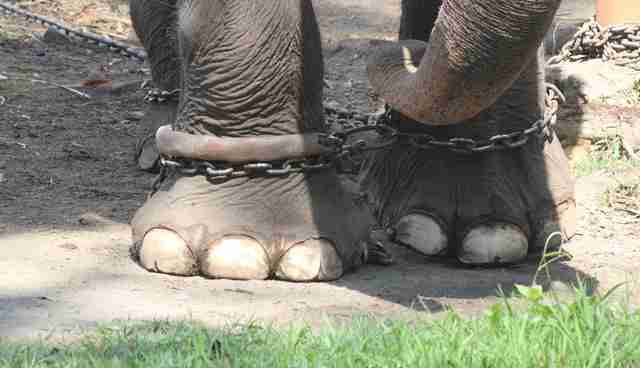 The animals are not only chained to the enclosures by their back legs, but their front legs are tied together. 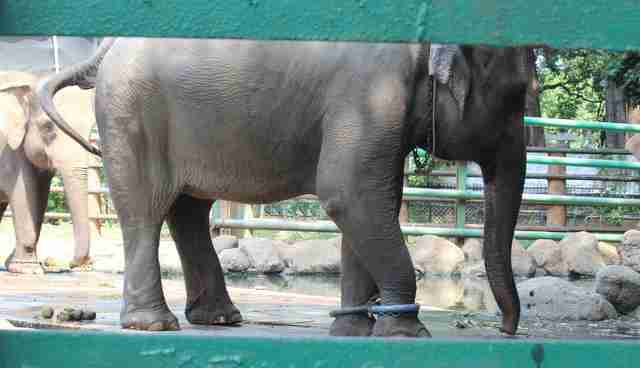 "I have visited zoos across the world, many of which unfortunately chain their elephants. 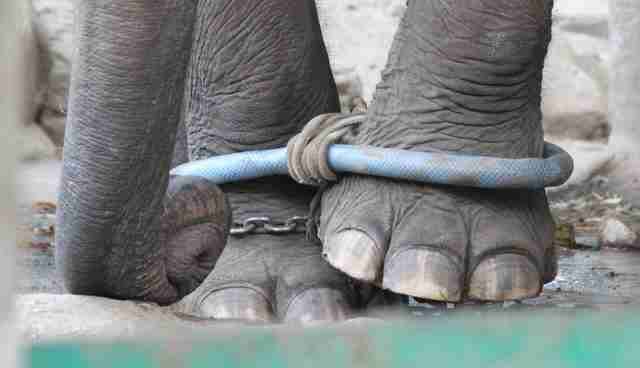 But I have never seen elephants with leg ties as well as chains," the staffer told The Dodo. With the additional leg ties, the elephants are unable to even move backwards and forwards freely, restricting them to "hobbling" or "hopping." 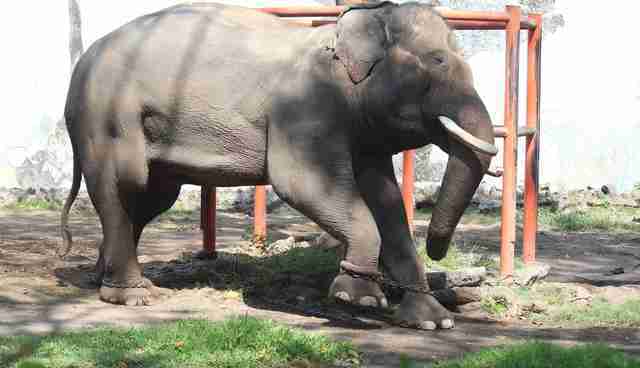 The male elephants who were tied in this manner at the Surabaya Zoo were in obvious distress: "He was rocking backwards and forwards for some time in a stereotypical display often seen in captive elephants," says the staff member. "The real sad thing for him was when he decided to use the bar as a scratching post, he needed to haul himself and the chains, centimeter by centimeter, into a position where he could rub against the metal bar. This should be something that is freely available to him and not something that he is forced to work for by having to 'hobble' within the small areas that his chains allow him within." Female elephant at Ragunan Zoo, Jakarta. 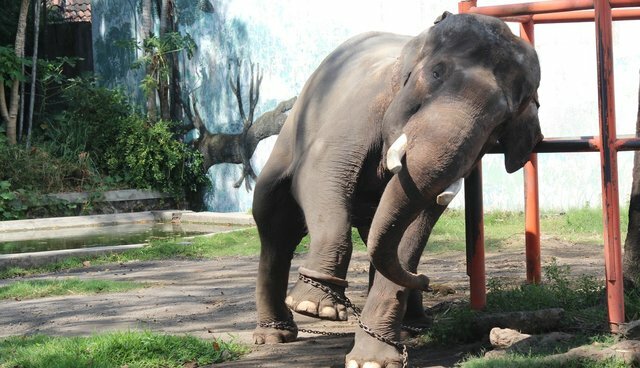 "[She was] chained by the back legs and with leg ties on her front legs preventing her from walking, constantly exploring the leg ties with her trunk in the hope she will find a way to release them," wrote the staff member of an animal advocacy organization. Indonesia has long been criticized for its animal welfare standards, especially the Surabaya Zoo, in East Java, referred to as the "Zoo of Death" for the horrific conditions the animals live in and the nauseating photos that reportedly emerge from it, including a lion found hanging last year in his cell, and an emaciated camel eating in his enclosure. In one photo, a woman is seen throwing watermelon at the only chimpanzee in a cement exhibit surrounded by a discolored moat. Melani, the tigress at the center of an investigation by Australia's ABC News in 2013 and the subject of online protests, was ultimately rescued from the Surabaya Zoo and taken to another park. Despite efforts to save her, she died not long after. Femke den Haas is the founder and coordinator for wildlife rescue at the Jakarta Animal Aid Network (JAAN). Den Haas lives in Indonesia and first visited the Ragunan Zoo 20 years ago: "I was so shocked to see the suffering of the animals there that I decided I wanted to return to Indonesia the soonest to help improve animal welfare in the country." It was the eyes, she says, of one adult male orangutan that she couldn't forget: "His name was Johnny. Johnny was an adult orangutan inside a tiny dark cage, not able to climb, not even able to obtain any sunlight." Twenty years later, she told The Dodo, Johnny is still inside the same cage. "We have tried hard to work with [the zoo], to improve the welfare of the animals," she says. "We have been in endless discussions about the need to improve the welfare for the animals and always are told that things will improve soon." Since 2013, however, JAAN has been denied access to help improve the quality of care for the animals of the zoo, den Haas claims. Part of the problem, she maintains, is there is no standard of care for animal welfare in zoos in Indonesia. "The Indonesia Zoo and Aquarium Association (IZAA) is a sham. This association is run by the zoo owners who seek profit and little regulations. 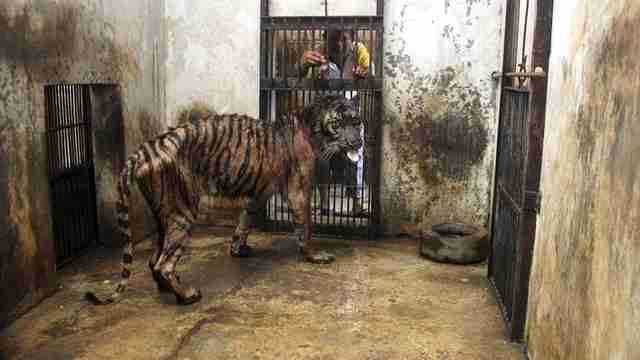 The conditions of animals throughout Indonesia in zoos are horrific. I just returned from a zoo in Banyuwangi that received animals from Surabaya [Zoo], including orangutans and elephants. The elephants are chained and walked around [by keepers] with the infamous sticks with nails on them to handle the elephants and [use them for] elephant rides." Unfortunately, says den Haas, as bad as the Ragunan and Surabaya zoos are, there are some even worse. At these zoos, says den Haas, "animals hardly are seen with even drinking water." The staff member of the advocacy group that provided the photos to The Dodo agrees with den Haas' assessment: "Sadly, animals are kept in even worse conditions in other zoos both within Indonesia and other Asian countries." "The sad reality," the staffer adds, "is that the majority of Asian zoos house as many species and individuals as they possibly can, and the staff have little to no knowledge of how to care for these individuals to meet their complex physical and behavioral needs. Therefore animals languish in squalid concrete cells and the measure of 'good' or 'bad' is whether they survive or not." The Ragunan Zoo, the Surabaya Zoo, WAZA and the IZAA did not immediately return The Dodo's request for comment. To help JAAN improve the welfare of animals in zoos, go here.